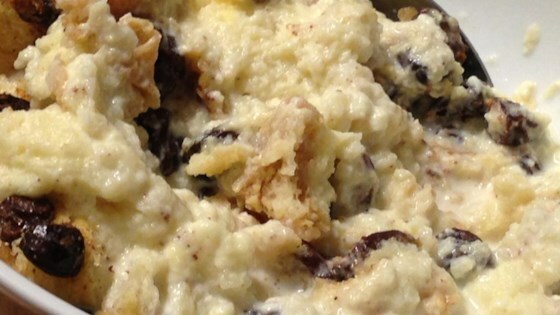 "I received this recipe from my husband's aunt who has been serving this at her restaurant for years. Great for people who don't like bready things, because it has more custard than bread." Blend half-and-half, eggs, sugar, vanilla extract, and salt in a blender until smooth. Arrange bread in a 9x13-inch baking dish; sprinkle with raisins and cinnamon. Pour egg mixture over bread. Place baking dish in a large roasting pan; fill roasting pan with boiling water halfway up the sides of the baking dish. Bake in preheated oven until set, about 1 1/2 hours. Serve warm or cold. I. Doubled the bread after I read it was really wet. The flavor was great but it was still way to wet for me. I love this recipe. I've made it three times and it always comes out so good! Thank you so much for sharing. I made this recipe last night and it is fantastic. More custard than bread pudding but full of yummy old fashioned goodness. I will be making this again and again. Thanks.